1883 Birth: Pierre Laval—in Auvergnac, France—French politician and four times Prime Minister of France, the final time being under the Vichy government. Laval was elected to parliament in 1903. 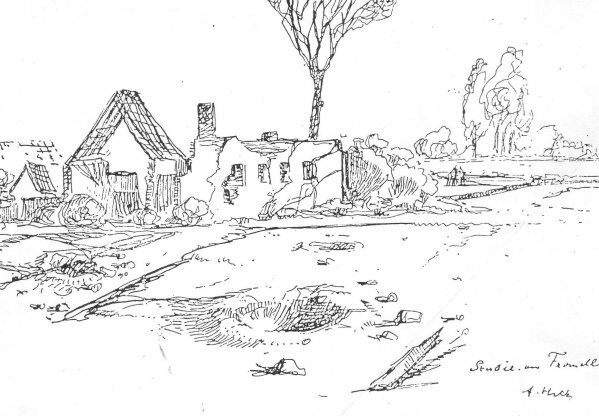 On the outbreak of the First World War Laval joined the French Army. After the war Laval political views changed dramatically and he re-entered the Chamber of Deputies as a right-wing conservative. One opponent pointed out that this was no surprising as Laval reads the same from the left or the right. Over the next few years he held several cabinet posts including foreign minister and was prime minister in 1931-32 and 1935-36. During his periods of office he worked closely with Aristide Briand to establish good relations with Germany and the Soviet Union. In October 1935 Laval joined with [Samuel Hoare], Britain's foreign secretary, in an effort to resolve the crisis created by the Italian invasion of Ethiopia . . . . Details of the Hoare-Laval Pact were leaked to the press on 10th December, 1935. The scheme was widely denounced as appeasement of Italian aggression and Laval and Hoare were both forced to resign. Laval returned to pursue his business career and built up a commercial empire based on newspapers, printing, and radio. When the German Army occupied France in 1940 Laval used his media empire to support Henri-Philippe Petain and the Vichy government. He also used his influence in the National Assembly to give Petain dictatorial powers. Two days later on 12 July 1940, Laval was named as head of the government and Petain's legal successor. Laval developed a close relationship with Otto Abetz, the German ambassador in France, and on 22 October, 1940, he met Adolf Hitler and proposed that the two countries should work closely together. At another meeting with Hermann Goering later that month Laval suggested a military alliance with Nazi Germany. Some members of the government became concerned about these developments and on 13 December 1940, Henri-Philippe Petain ordered the sacking of Laval. He was also briefly arrested but Otto Abetz sent in troops to have him released and he was taken to Paris where he lived under the protection of the German Army. However on 27 August, 1941, a young student, Paul Collette, managed to fire four shots into Laval while seeing off French volunteer troops to take part in Operation Barbarossa. Laval recovered and by the spring of 1942 he was ready to return to political life. After coming under increasing pressure from Otto Abetz, the German ambassador, Henri-Philippe Petain agreed on 18th April 1942 to recall Laval as head of the French government. Laval now ordered the French police to begin rounding up Jews in France. He also took the controversial decision in June 1942 to send skilled labourers to Germany in exchange for French prisoners of war. In September he gave permission for the Gestapo to hunt down the French Resistance in unoccupied France. In January, 1943, Laval created Milice, a political police force under the leadership of Joseph Darnard. Within six months there were over 35,000 men in the force and were playing the leading role in capturing Jews and left-wing activists and having them deported to Nazi Germany. After the D-Day Landings Laval moved his government to Belfort. With the allied forces making good progress Laval retreated to Sigmaringen and in May 1945 he fled to Spain. He was interned in Barcelona and on 30 July was handed over to the new French government headed by General Charles De Gaulle. Pierre Laval was charged with aiding the enemy and violating state security. He was found guilty and was shot by a firing squad at Fresnes Prison in Paris on 15 October, 1945. 1891 Birth: Carl Spaatz: Leading U.S. combat air commander in World War II and the first chief of staff of the independent U.S. Air Force. A graduate (1914) of the United States Military Academy at West Point, New York, Spaatz served as a combat pilot during World War I and then acquired extensive staff and command experience between 1919 and 1942. He went to England in 1940 to evaluate German military power, and in July 1942, after the United States had entered the war, he took command of the Eighth Air Force in England. Early in 1943 he was shifted to the Mediterranean theatre, where he commanded the Northwest Africa Air Forces and then directed air assaults against Italy. In January 1944 he became commander of the U.S. Strategic Air Forces in Europe. In this capacity he directed the daylight precision bombing of Germany and occupied lands from both England and Italy until the end of the war in Europe--complementing the nighttime saturation bombings directed by Arthur Harris, his counterpart in the Royal Air Force Bomber Command. In preparation for the Normandy Invasion of June 1944, Spaatz's air forces mounted huge bombing runs against Germany's aircraft industry and then its petroleum and synthetic fuel industries. Death: Archduke Franz Ferdinand—heir to the Austrian-Hungarian throne—and his wife, Sophie, are shot dead in the streets of Bosnia's capital, Sarajevo. The great Prussian statesman Otto von Bismarck, the man most responsible for the unification of Germany in 1871, was quoted as saying at the end of his life that "One day the great European War will come out of some damned foolish thing in the Balkans." It went as he predicted. The archduke traveled to Sarajevo in June 1914 to inspect the imperial armed forces in Bosnia and Herzegovina, former Ottoman territories in the turbulent Balkan region that were annexed by Austria-Hungary in 1908 to the indignation of Serbian nationalists, who believed they should become part of the newly independent and ambitious Serbian nation. The date scheduled for his visit, June 28, coincided with the anniversary of the First Battle of Kosovo in 1389, in which medieval Serbia was defeated by the Turks. Despite the fact that Serbia did not truly lose its independence until the Second Battle of Kosovo in 1448, June 28 was a day of great significance to Serbian nationalists, and one on which they could be expected to take exception to a demonstration of Austrian imperial strength in Bosnia . . . . Franz Ferdinand and Sophie were touring Sarajevo in an open car, with surprisingly little security, when Serbian nationalist Nedjelko Cabrinovic threw a bomb at their car; it rolled off the back of the vehicle and wounded an officer and some bystanders. Later that day, on the way to visit the injured officer, the archduke s procession took a wrong turn . . . where one of Cabrinovic s cohorts, 19-year-old Gavrilo Princip, happened to be loitering. The assassination of Franz-Ferdinand and Sophie set off a rapid chain of events: Austria-Hungary, like many in countries around the world, blamed the Serbian government for the attack and hoped to use the incident as justification for settling the question of Slav nationalism once and for all. As Russia supported Serbia, an Austro-Hungarian declaration of war was delayed until its leaders received assurances from German leader Kaiser Wilhelm that Germany would support their cause in the event of a Russian intervention, which would likely involve Russia s ally, France, and possibly Britain as well. On July 28, Austria-Hungary declared war on Serbia, and the tenuous peace between Europe's great powers collapsed. Within a week, Russia, Belgium, France, Great Britain and Serbia had lined up against Austria-Hungary and Germany, and World War I had begun. Hitler is studying quietly in his room, when he hears confused shouting in the street below. Heading down the narrow stairs, he encounters an excited Frau Popp shouting: "The Austrian heir to the throne has just been murdered!" Hitler makes his way past her to the street, joining the crowds around the giant posters announcing the assassination. At first, he is apprehensive, fearing that the event was perpetrated by German students. But soon, to his great relief, he learns that the Serbs are responsible. It was lucky for Germany that the war of 1914 broke out with Austria as its direct cause, for thus, the Habsburgs were compelled to participate. Had the origin of the War been otherwise, Germany would have been left to her own resources. The Habsburg State would never have been ready or willing to take part in a war, for the origin of which Germany was responsible. Hitler—an ardent German nationalist and voracious reader of newspapers—may have been surprised by the assassination itself, but he could hardly have been taken too unawares by subsequent events. Nationalist feelings had for years been fomenting among the various disparate peoples of the polyglot Austro-Hungarian Empire, and anyone keeping up with the current events of the time could have predicted that matters would one day come to a head. Hitler is very excited by the rapidly moving events of the following weeks, absolutely convinced that ethnic Germans will come out on top and realize their long delayed aspirations to form a greater German state, independent of the Habsburg Empire he hates. These occurrences also offer him an opportunity to escape his humdrum hand-to-mouth existence and to participate in historic events unequaled in his twenty-five years. The "most memorable period" of his life had finally arrived. Birth: Aribert Heim—in Radkersburg, Austria—a doctor at the Mauthausen concentration camp during World War II, and known to inmates as "Dr. Death". Heim was known for performing often-fatal operations and experiments on patients which included injecting various solutions into Jewish prisoners' hearts to see which killed them the fastest, operating without anesthesia, and removing organs from healthy inmates and then leaving them to die on the operating table. Until the 2009 discovery of his death, Heim remained the Simon Wiesenthal Center's most wanted Nazi war criminal and there was a reward of $405,000 for information that would lead to his capture. Heim . . . joined the local Nazi party in 1935, three years before Austria was annexed by Germany. In 1940, he later volunteered to join Hitler's elite Waffen SS. In October 1941, Heim was assigned to Mauthausen near Linz, Austria as a camp doctor. While at the concentration camp, Heim worked closely with SS pharmacist Erich Wasicky and carried out gruesome experiments likened to those of Joseph Mengele at Auschwitz. Heim was also a doctor at Buchenwald and Sachsenhausen concentration camps. . . . . The greatest attention had been given to the staging of the culminating event in the Hall of Mirrors. It is a long and narrow room, more like a corridor than a salon. The delegates ascended the marble staircase and passed through what at one time were the apartments of Marie Antoinette to the Salon de la Paix, the Hall of Peace, whence they entered the Hall of Mirrors. At this end of the hall were the chairs for the invited guests. Then came tables for secretaries of certain delegations. Beyond that stood the long horseshoe table that ran along the mirrored side of the hall. The English economist John Maynard Keynes, who had attended the peace conference but then left in protest of the treaty, was one of the most outspoken critics of the punitive agreement. In his The Economic Consequences of the Peace, published in December 1919, Keynes predicted that the stiff war reparations and other harsh terms imposed on Germany by the treaty would lead to the financial collapse of the country, which in turn would have serious economic and political repercussions on Europe and the world. It soon became apparent that the treaty would bear only a faint resemblance to the Fourteen Points that had been proposed by Wilson and embraced by the Germans. Wilson, a great idealist, had few negotiating skills, and he soon buckled under the pressure of Clemenceau, who hoped to punish Germany as severely as it had punished France in the Treaty of Frankfurt that ended the Franco-Prussian War in 1871. Lloyd George took the middle ground between the two men, but he backed the French plan to force Germany to pay reparations for damages inflicted on Allied civilians and their property. Since the treaty officially held Germany responsible for the outbreak of World War I (in reality it was only partially responsible), the Allies would not have to pay reparations for damages they inflicted on German civilians. The treaty that began to emerge was a thinly veiled Carthaginian Peace, an agreement that accomplished Clemenceau's hope to crush France's old rival. According to its terms, Germany was to relinquish 10 percent of its territory. It was to be disarmed, and its overseas empire taken over by the Allies. Most detrimental to Germany's immediate future, however, was the confiscation of its foreign financial holdings and its merchant carrier fleet. The German economy, already devastated by the war, was thus further crippled, and the stiff war reparations demanded ensured that it would not soon return to its feet. A final reparations figure was not agreed upon in the treaty, but estimates placed the amount in excess of $30 billion, far beyond Germany's capacity to pay. Germany would be subject to invasion if it fell behind on payments. Keynes, horrified by the terms of the emerging treaty, presented a plan to the Allied leaders in which the German government be given a substantial loan, thus allowing it to buy food and materials while beginning reparations payments immediately. Lloyd George approved the "Keynes Plan," but President Wilson turned it down because he feared it would not receive congressional approval. In a private letter to a friend, Keynes called the idealistic American president "the greatest fraud on earth." On June 5, 1919, Keynes wrote a note to Lloyd George informing the prime minister that he was resigning his post in protest of the impending "devastation of Europe. "At Smuts' urging, Keynes began work on The Economic Consequences of the Peace. It was published in December 1919 and was widely read. In the book, Keynes made a grim prophecy that would have particular relevance to the next generation of Europeans: "If we aim at the impoverishment of Central Europe, vengeance, I dare say, will not limp. Nothing can then delay for very long the forces of Reaction and the despairing convulsions of Revolution, before which the horrors of the later German war will fade into nothing, and which will destroy, whoever is victor, the civilisation and the progress of our generation." Germany soon fell hopelessly behind in its reparations payments, and in 1923 France and Belgium occupied the industrial Ruhr region as a means of forcing payment. In protest, workers and employers closed down the factories in the region. Catastrophic inflation ensued, and Germany's fragile economy began quickly to collapse. By the time the crash came in November 1923, a lifetime of savings could not buy a loaf of bread. That month, the Nazi Party led by Adolf Hitler launched an abortive coup against Germany's government. The Nazis were crushed and Hitler was imprisoned, but many resentful Germans sympathized with the Nazis and their hatred of the Treaty of Versailles. "The character of the mandate must differ according to the stage of the development of the people, the geographical situation of the territory, its economic conditions and other similar circumstances." The Catholic Center party was a pillar of the Weimar Republic. It had in general resisted the Nazi rise to power, although the right wing of the party was led by politicians at least willing to tolerate a Hitler government. Once Hitler became chancellor in January 1933, the Center party supported measures giving him dictatorial power. On July 5, 1933, the Center party—under intense Nazi pressure—dissolved itself. The German Democrats (Staatspartei) dissolve themselves. 1938 Switzerland: Neutrality officially recognized by Germany and Italy. 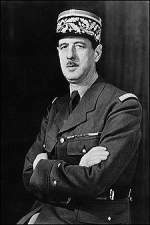 At the beginning of World War II, de Gaulle was commander of a tank brigade. He was admired as a courageous leader and made a brigadier general in May 1940. After the German invasion of France, he became undersecretary of state for defense and war in the Reynaud government, but when Reynaud resigned, and Field Marshal Philippe Petain stepped in, a virtual puppet of the German occupiers, he left for England. On June 18, de Gaulle took to the radio airwaves to make an appeal to his fellow French not to accept the armistice being sought by Petain, but to continue fighting under his command. Ten days later, Britain formally acknowledged de Gaulle as the leader of the "Free French Forces," which was at first little more than those French troops stationed in England, volunteers from Frenchmen already living in England, and units of the French navy. Central Europe: As the world's attention is occupied elsewhere, the Soviet Union invades and annexes Bessarabia, Northern Bukovina and Hertza County. 1941 World War II: German troops of Heeresgruppe Mitte capture Minsk: German forces occupied Minsk, capital of the Belorussian Soviet Socialist Republic (SSR) in the Soviet Union, shortly after the German invasion of the Soviet Union in June 1941. During the German occupation, the Belorussian SSR became part of the Reich Commissariat Ostland (Reichskommissariat Ostland). Within this German civilian administration, Minsk became a district capital. Wilhelm Kube, the German general commissioner of Belorussia, governed from Minsk. In late July 1941, the Germans established a ghetto in the northwestern part of Minsk. About 80,000 people, including Jews from nearby towns, were crowded into the Minsk ghetto. 1942 World War II: Beginning of the first stage of Fall Blau (Operation Blue), the new German summer offensive on the southern front in Russia. From the area of Kursk, the German 2nd Armee and 4th Panzerarmee, with 50 divisions, advance toward Voronezh on the upper Don. The Soviets did not know where the main German offensive of 1942 would come. Stalin was convinced that the German objective of 1942 would be Moscow and over 50% of all Red Army troops were deployed in the Moscow region. Only 10% of Russian troops were deployed in Southern Russia. On 28 June 1942, the German offensive began. Everywhere the Russians fell back as the Germans sliced through the Russian defenses. 1943 World War II: A partial translation of a report from the chief of Main Office III with the High Command in Minsk sent to Ministerialdirektor Riecke, a top official in the Rosenberg Ministry: "Thus recruitment of labor for the Reich, however necessary, has had disastrous effects, for the recruitment measures in the last months and weeks were absolute manhunts, which have an irreparable political and economic effect . . . . From . . . White Ruthenia approximately 50,000 people have been obtained for the Reich so far. Another 130,000 are to be taken. Considering the 2,400,000 total population . . . the fulfillment of these quotas is impossible. 1944 World War II: Operation Epsom designed to break through the German defenses near Caen is halted by the fierce resistance of the I. and II. SS-Panzerkorps. The mission was to bring Caen and the surrounding countryside under Allied control. Dempsey had 60,000 soldiers, over 700 pieces of artillery and about 600 tanks under his command, although most of the troops had seen very little combat to that point. The Allied attack was hampered by bad weather and bad preparation. The allied artillery supported the advance with a creeping barrage. 1945 Poland: The Polish Provisional Government of National Unity is set up by the Soviets. Dr Fritz: Some of the Prosecution's witnesses have asserted during this Trial that the German public knew about these murders (of Jews). Now I just want to ask you, as a journalist who worked in the National Socialist State, what was, as far as you know, the attitude of the broad mass of the German people to the Jews? Did the people know about the murder of the Jews? Please be brief. Fritzsche: . . . . I should like to mention only a few observations which to me seem important . . . . When the Jews were forced to wear the emblem of a star and when, for instance, in Berlin they were prohibited from occupying seats on streetcars, the German people openly took sides with the Jews and it happened again and again that Jews were ostentatiously offered seats. 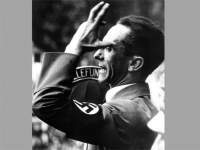 In this connection I heard several declarations by Dr. Goebbels, who was extremely bitter about this undesired effect of the marking of the Jews. I, as a journalist who worked during that period, am firmly convinced that the German people were unaware of the mass murders of the Jews and assertions to that effect were considered rumors; and reports which reached the German people from outside were officially denied again and again . . . .
Fritzsche gave a poor performance in the witness box—which was particularly surprising since his broadcasts had often been ably improvised from a few written notes. The professional communicator who had tried to coach other defendants to deliver their testimony cogently and effectively was himself clearly nervous, and he rambled in a diffuse often disjointed style for nearly two days . . . .
Half-buried in his testimony, scattered in fragments among other matters, was the condemnation of Hitler and the Nazi leadership which he had been long considering and over which he had liaisoned with Speer . . . .It was symptomatic of the general exhaustion and boredom which gripped all participants at the trial by this time that Fritzsche's statement evoked little response and virtually no Press coverage. In part this apathy was his own fault. The statement had come in isolated sentences, had been lost in general verbiage and illogicality of his testimony. Yet pieced together, his views are striking. Fritzsche almost alone of all the defendants had blamed both the Nazi leadership and himself. He viewed the regime as a whole, faced its logic, and traced the moral consequences of its beliefs . . . .He had actually learned something from the trial. 1948 The Yugoslav Communist Party is expelled from Cominform at a meeting in Bucharest, marking the formal breach in relations between Yugoslavia and the rest of the Communist bloc. 2006 Death: George Unwin: British fighter ace WWII: During the Battle of Britain, stationed in 12 Group, he was credited with 14 enemy aircraft shot down by the end of 1940 and awarded with the DFM with bar. Later in the war he was given a commission and flew DeHavilland Mosquito day fighters with 613 Squadron. His service-wide nickname was "Grumpy"; received, as the story goes, after he complained about the noise squadron mate Douglas Bader made repairing one of his leg prostheses late at night in late 1939. It kept Unwin awake and he let everyone know about it. Another story goes it was due to his reaction at being left out of the squadron's operations over Dunkirk on 26 May 1940, due to the shortage of aircraft. Two Canadian teachers who wanted a memento of their trip to Auschwitz . . . . were caught in possession of retaining pins used to hold down the rails which once transported hundreds of thousands to their death. "The men were caught red handed by security and handed over to the police by the museum," said Bartosz Bartyzel, for the Auschwitz museum press office. He added that while the pins had no material value they were of "enormous historical value."